Barbara is an artist from Northern Wisconsin whose work reflects a lifetime of being influenced by world cultures and the natural surroundings of the Northwoods. Her art portrays experiences from both subjects. She has been passionate about being an artist since childhood, and has continued to study multiple art mediums throughout her career. Barbara has won awards in national juried competitions while also participating in international one-woman shows as well as many group exhibitions. 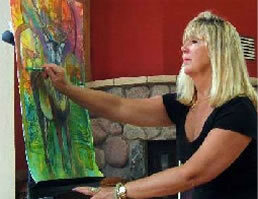 Her work may be found in numerous corporate and private collections. Barbara has Taught Workshops in Switzerland, France, the Caribbean, and the United States.